It’s a puzzling question that remains remarkably hard to answer, and leaves many pondering and scratching their heads. No, I’m not talking about the meaning of life or love, but where to find a halfway-original and special gift from Paris that doesn't rhyme with "kitsch" or "schlock". With shops taking up nearly every street in the city, it’s easy to get overwhelmed. And with hundreds of stores peddling boring, cliche “I Love Paris” paraphernalia to tourists who aren't sure where else to look, you may be throwing your hands up in despair. Fear not. If you know where, and how, to look, the French capital is a treasure trove for unique and thoughtful gifts. With this list and you’re sure to find the perfect item for that special someone back home who couldn’t make the trip with you. If you’re looking for an edible gift that strays away from sweets, Paris offers some fabulous gourmet food shops. Here you'll find an abundance of goodies that will be a real treat to your loved ones back home. Fauchon makes gorgeous perfumed teas that will send your senses into overdrive, with a choice of coffees, jams, oils and pâtés as well. Or head over to Hediard, considered by many to be the best gourmet food shop in Paris. Here you’ll find high-quality foie gras, mustards, oils, sauces and herbs. Also try gourmet grocer La Grande Epicerie, tucked in the confines of the high-end Bon Marché department store – a one-stop shop for gourmet and artisanal items, like truffle oils, wine, cheese and cured meats. Finally, Lafayette Gourmet (its exotic spices display is pictured here) is another wonderland for the food-crazy. There’s something oh-so-very French about trolling through Paris' flea markets, or "puces", on a Saturday morning, ambling and people-watching. But there is also a wealth of unusual gift items available at the city’s many markets. You can find antique jewelry, clothing or trinkets at the Marché aux puces at Saint Ouen. Try the southernly Porte des Vanves market if it’s furniture, paintings or jewelry you’re after, or the Marche du Livre Ancien et d’Occasion to find used or rare French books. The French are known for their indulgently dark, rich, and aromatic chocolate, and while this sweet treat may not be the most original of presents, it’s almost guaranteed to please nearly anyone. Check out Frenchie chocolatier Patrick Roger’s original creations made with Ethiopian coffee, tropical vanilla and various fruits, and admire his giant chocolate sculptures-- from orangutangs to elephants-- in his shop windows. Michel Chaudun is the place to head for scrumptious, unpretentious truffles and cubes of ganache. And yet another household name in French chocolate, this time specializing in decadent pastries, is Pierre Herme, whose “Death by Chocolate” creation dessert just might put you over the chocoholic edge. While concept stores are not exactly easy on the budget, they’re the place to go for unique items and the latest in trendy fashions, electronics and design. For men’s fashion, head to L’Eclaireur which debuted on the Champs-Elysées in the 1980s. This is the place where fashion, design and lifestyle meet, and you’ll find all the major clothing designers here, from Versace to Balmain to Oscar de la Renta. Want to give back to the community and shop at the same time? Try Merci-- a concept store adored by well-thinking bobos, where a percentage of profits go to charities. In the age of Amazon and its admittedly ruthless business tactics, Paris is a defiant stronghold for the traditional, independent and family-owned bookshop. Find a beautiful first edition of a classic work of literature, antique travelogues, or other unique gifts for bookworms at one of these hallowed institutions. Shakespeare & Company, pictured here, is perhaps the most legendary of all. 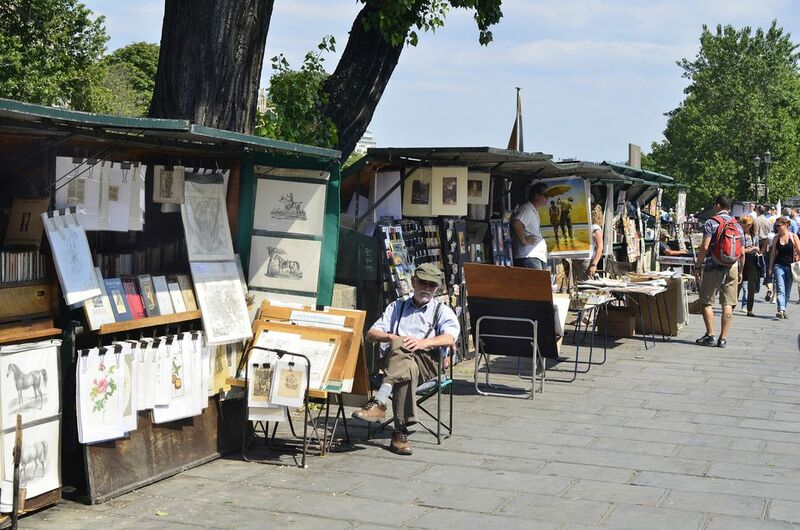 Also make sure to browse and sift at the traditional Seine-side booksellers, with their metallic green stalls glinting alongside the river. The French are talented at many things, and perfume is definitely one of them. France’s history in fragrance goes back to the medieval period, and the country is home to some of the world’s most prestigious fragrance houses. Paris, of course, has some of the best perfume shopping opportunities in the world. Try household name Guerlain, which began making perfume magic back in 1828, and is now a global name associated with elegance and sensuality. At Maitre Parfumeur et Gantier, the motto is creativity, emotion and quality, and this is exactly what you’ll get from this Parisian perfumer. Fragrances come in divine old-fashioned bottles, with fruity, floral scents for women and warm, spicy notes for men. For that very eccentric or demanding someone who wants only the weirdest gifts around, or perhaps reminds you a bit of Little Edie Bouvier of "Grey Gardens" fame, peruse these parlors of Parisian strange for gifts that are "spécial" in the French sense: odd and potentially a little bit unnerving/disturbing. From curiosity cabinets to dusty old vintage stores, you'll stray far from the usual in gift purchases by heading to these oddest of Parisian merchants. If you're looking for a special gift but find yourself with limited funds, it is possible to go shopping on a budget in Paris. After all, sometimes it's small but thoughtful items that count, and touch hearts, the most. You can also learn how, and when, to take advantage of annual sales in the city of light-- making certain previously unaffordable items suddenly within your reach!